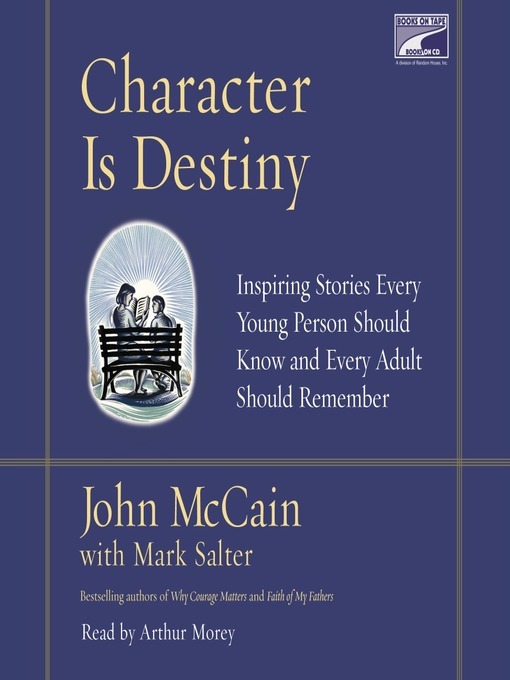 John McCain and Mark Salter have written three acclaimed bestsellers, but CHARACTER IS DESTINY may be their most influential and enduring book yet–a work for parents to share with their children, and for Americans of all ages to listen to for inspiration and guidance. McCain has been called "one of the most inspiring public figures of his generation" by The Washington Post. In CHARACTER IS DESTINY, he shows us why, by telling the stories of celebrated historical figures and lesser-known heroes whose values exemplify the best of the human spirit. He illustrates these qualities with moving stories of triumph against the odds, righteousness in the face of iniquity, hope in adversity, and sacrifices for a cause greater than self-interest. In CHARACTER IS DESTINY we meet heroes of exemplary character. This book is John McCain's moving and eloquent tribute to men and women who have lived truthfully, and whose stories will stir the hearts of young and old alike and help prepare us for the hard work of choosing our own destinies.